Often the best takeaway of a race isn’t your finisher’s medal or time, but the fun you had on the course. Without volunteers and cheer stations, a lot of that fun would be sorely missed. Help ensure a good time for your fellow triathletes by volunteering or cheering at one (or all) of these club-sponsored events! Watch the GGTC newsletter, calendar and social channels for sign-up announcements. Those that require signup forms will include a link. Please remember that once you sign up, we’re counting on you to be there. If your plans change, please tell as soon as possible. We often organize carpools for volunteering events. When you signup for an event, the Volunteer Director will help coordinates rides and it would be appreciated if those with space could offer their cars up for carpooling. We love our club colors, so GGTC gear and red/black attire is always encouraged. If you’re feeling festive, bring accessories and dress in costume - race participants always enjoy that! Noisemakers, clapping hands, and cow bells are always a great addition to any aid station or cheer tent. Sign up to volunteer and you’ll be given a 50% credit for another USAP event of your choosing; good for one year! Bring out your leis, grass skirts and board shorts and join GGTC as we cheer on and support our fellow athletes at IRONMAN Santa Rosa 140.6 on Saturday, May 11th! We will be out there taking over a Run Aid station and will have three shifts to choose from, so there are plenty of opportunities to come out and show your support! Come out and volunteer with GGTC at the iconic Escape from Alcatraz triathlon on Sunday, June 9rd! We will be volunteering at Run Aid Station #2 located at the intersection of Long Avenue and Marine Drive. In years past, all volunteers have been entered into a special drawing for a 1 in 3 chance of securing a spot and discounted entry into the next year’s race (approx. $150 off). More details related to this year’s perks will be announced closer to the event, so stay tuned! Join GGTC as we cheer on and support our fellow triathletes at IRONMAN Santa Rosa 70.3 on Saturday, July 27th! We will be taking over a Run Aid station and will have two volunteer shifts available! Exact times and details to be announced closer to the event. Wish you had some use for your Santa suit, Grinch outfit or reindeer costume?? It’s time to break out that favorite costume/onesie and come out to volunteer with us at the North Face Endurance Challenge to support and cheer on all those crazy marathon, 50K and 50 mile runners as they take on the hills and trails of the Marin Headlands! 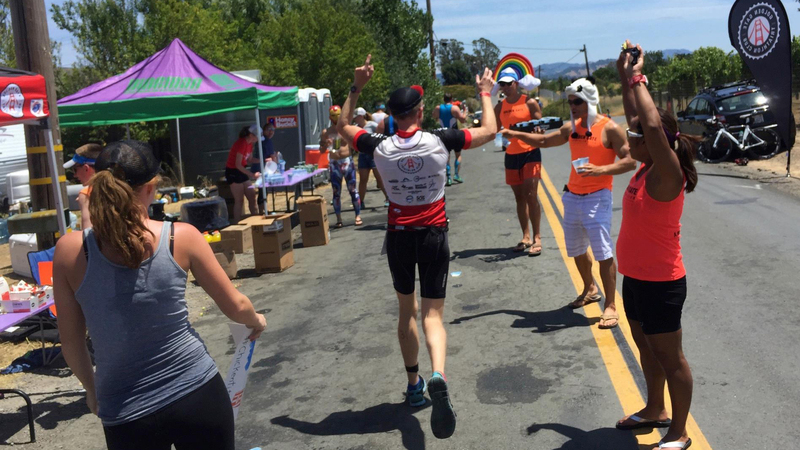 We’ll be out there cheering and volunteering at the Muir Beach Aid station! Date and time still TBD but stay tuned for more information! !